Curtis Davies looks set to miss the rest of the season. Derby County captain Curtis Davies has refused to become an outsider as he continues to have an active role off the pitch whilst recovering from long-term injury. The 33-year-old is determined to fulfil his responsibilities as captain of the football club despite being sidelined for the remainder of the season. And he says he's kept a constant presence at the club's Moor Farm training ground, as well as at matches. He said: “Everyday I’m still in the changing room with the boys. I’m always asking them how it went at the weekend and if someone’s injured and in the treatment room, I’m the first to go and see them. 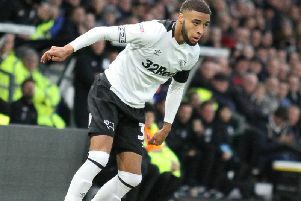 Davies ruptured his achilles tendon during Derby’s 2-1 league defeat to Stoke City in November 2018, and after undergoing surgery the defender is not expected to return to action until next season. “I just try to float about and pick people up if they’ve had a bad result and at the same time if we’ve had a positive result I say, ‘yeah but they were also good’ to still keep things on an even keel," he said. Davies made 48 appearances for the Rams under former manager Gary Rowett last term, and he remains confident in the style of football that Frank Lampard has brought to the club. “This year the new manager has come in and he's implemented the way he wants to play and the things he wants to get from us,” he said. Derby currently sit in seventh place in the Championship and Frank Lampard will be hoping his side can bounce back from their disappointing 1-0 defeat to rivals Nottingham Forrest on Monday as they face Aston Villa at Villa Park on Saturday.